Do you ever wanna cry out “I want my mommy!” If you admit to that, I won’t tell a soul. You can come huddle with me in the corner and we can both cry into our childhood teddy bears and then pretend to the rest of the world that we’ve got our shyou-know-what together. We are tough cookies. We don’t need our mommies. We are adults who know how to keep it all together, no matter what. Well, you’ve been rescued. (Not that you needed to be, of course). Cue golden trumpets and glorious angels singing. Enter: Mama’s Kicked Up Goulash. Comfort of mom = a blankie = a warm bubble bath = chocolate = a long nap = a crackling fireplace = goulash. See how my mind works? If you’re thinking you need your mommy so badly that this pasta dish isn’t going to cut it, we’ve got bigger problems. We need to pull out the big guns. Forget dinner. Go straight to dessert. 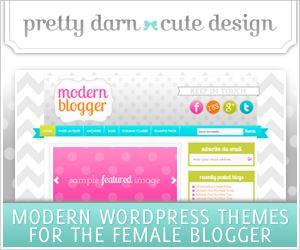 Try my Dark Chocolate Cookies or Ultimate Chocolate Mousse. 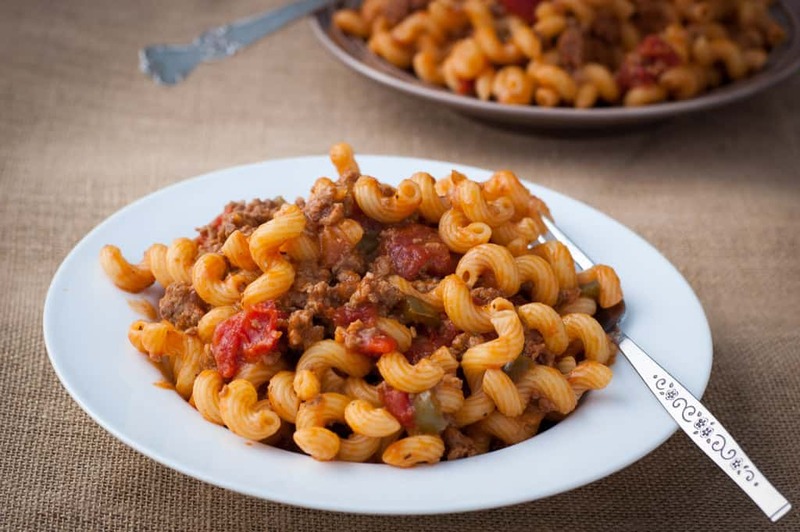 If you’ve never had goulash before, you might be feeling scared right about now. 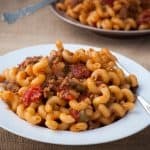 What in the heck is goulash? I’m not going to sugar coat it. The name doesn’t sound too appetizing. Your opinion will soon change. 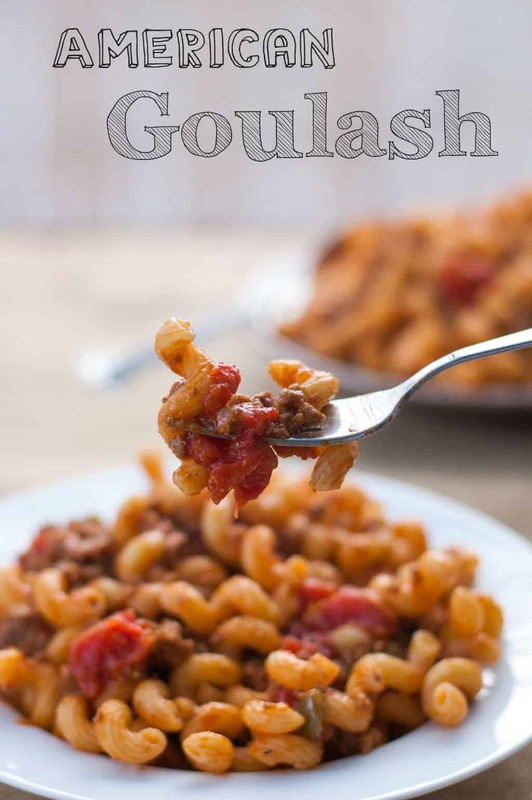 Like Pavlov’s dog, I will have you salivating when you hear that sweet little word, goulash. This is not the typical Hungarian goulash that you might find as a stew with lots of paprika. This is adapted from my mom’s recipe that she used to make for us growing up, back when I was snuggling teddy bears in corners. Just kidding. I snuggled them in public. I’ve kicked it up a tiny bit, but the flavors still mimic my mom’s original recipe. I don’t want to mislead you. The flavors in this dish are rather mild, despite using a few spicy ingredients. It’s kicked up ever so slightly. No need to have a fire extinguisher nearby. Although I’ve never been a huge fan of green bell peppers, I would never leave them out of this dish. They compliment the other ingredients so perfectly. In medium bowl, combine first 7 ingredients (beef, sausage, bread crumbs, egg, Pecorino Romano, pepper, and kosher salt). With hands, combine until mixed well. Preheat a couple of turns of olive oil in a large nonstick skillet over medium-high heat. Add meat mixture to skillet and brown meat, stirring occasionally. (about 5-6 min) You want it to be a little browned, not just cooked. Meanwhile, fill large pot with water and add about 1 teaspoon of salt to water. Boil water and cook pasta according to package directions. When cooked, drain pasta. When onion mixture has cooked for about 4-5 minutes, push mixture to the sides of the skillet, creating another hole in the center. Add 1 tablespoon oil to center of pan. Add garlic to the center of skillet and cook for 30 seconds, then add back in the browned meat and stir. Add tomato sauce, stewed tomatoes, water, paprika, 1/4 teaspoon table salt, and fresh cracked pepper to skillet and stir to combine. Reduce heat to simmer and simmer for approximately 20 minutes or until pasta is done. As it is simmering, break up the stewed tomatoes into smaller pieces with a spoon or spatula. When the sauce is almost done, taste the sauce, if it needs more salt or pepper, add it now. 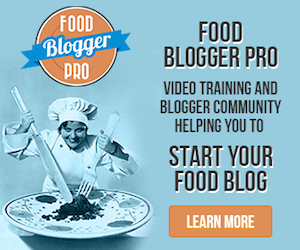 Great – let me know how the recipe turns out. Thanks for stopping by! This looks so great and I know it would be a big hit at our dinner table. 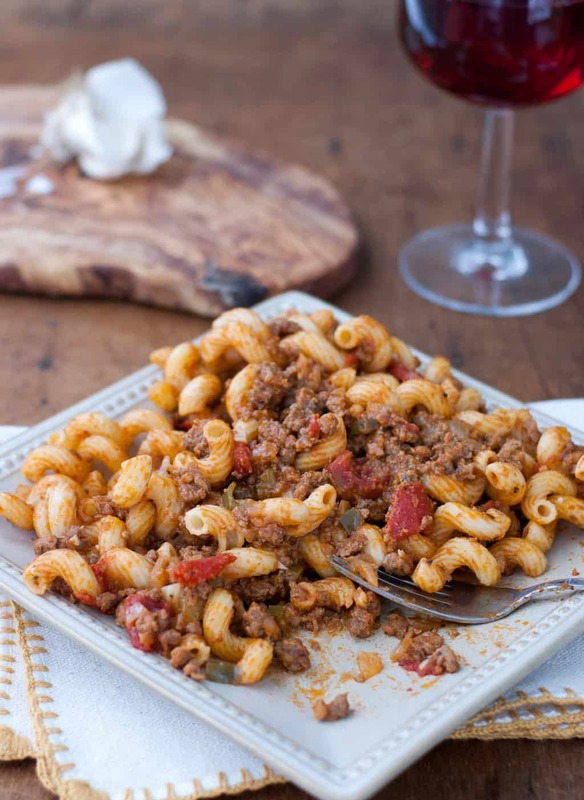 My mother used to make something like but it didn’t include Pecorino Romano, paprika or sausage… all big “yums” to me! Can’t wait to give this a try! Maybe our moms’ recipes were similar because my mom didn’t use Pecorino, paprika or sausage either. And I think she added corn to the recipe. Like all your recipes, this is a MUST TRY! recipe! I am going to make this soon! 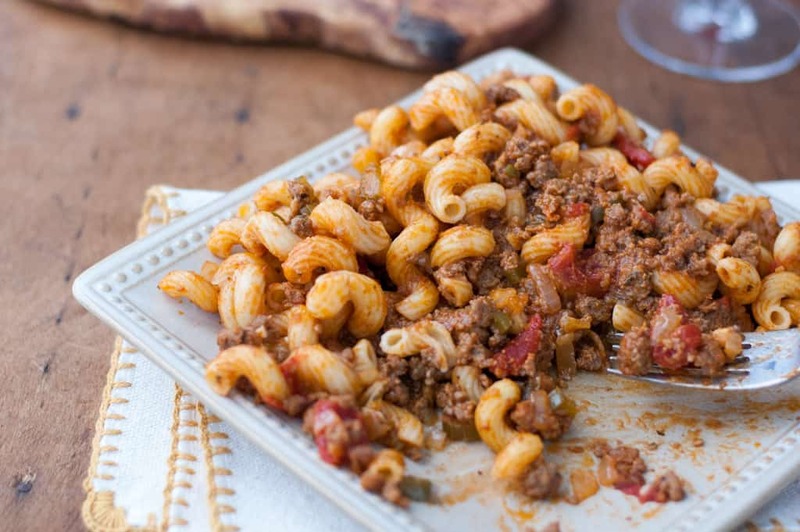 We’ve always called this American Chop Suey. Delish! Yes!!! I remember it as american chop suey too! It’s really one of those things that kind of doesn’t need a recipe. But when looking it up today, I saw so many using Italian seasonings. That drove me nuts! It’s not Italian!! I haven’t had this in years. I don’t even know what make me think of it. Now I can’t wait to make a version of it. I remember using ground beef way back when. Think it will be ground turkey this time, and maybe fire roasted tomatoes. My grandmother used to make this when I was a kid. Because it was one of those 1 pot dishes you just sort of threw together, she gave it her own name… hungie dungie. Ahhh what memories!